The apartment is situated in the heart of Stockholm (on the border between the neighbourhoods City/Norrmalm/Vasastan) close to the central station and the main shopping district. From here you a can easily access all the islands (by foot, bike, subway or boat). The apartment is 42 m2. It has a small bedroom area which can host 2 people, it also has a living room area with a sofa bed that can host 2 more people. It has a fully functional kitchen and a big bathroom. Please not that there are no closeable doors between the bedroom and the livingroom area. 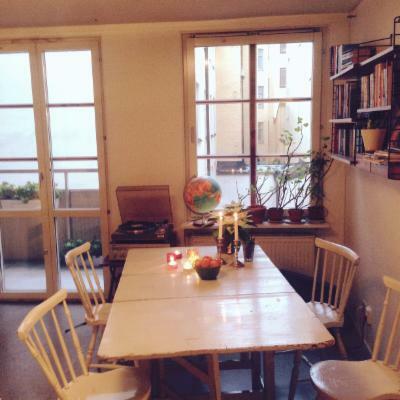 The apartment is literally 20 seconds away from the main shopping street – Drottninggatan. However, the street the apartment is situated on is very, very calm and the balcony faces the inner courtyard meaning the apartment is very silent, you rarely (never!) here any noise from the city. The area holds many nice bars/restaurants, they are just around the corner! Most of Stockholms famous sights are just a couple of minutes away. This is the perfect place to stay while enjoying this beautiful city!